Before designing your program, assess the market to help inform your decisions about your target audience, what services to provide, and how best to deliver those services. Don’t assume that you know what your market needs and what motivates your customers. You, after all, are most likely not your program’s target audience. Instead, do your homework to fully understand your market and craft your program to fit the specific needs and opportunities in your community. This handbook provides an overview of market assessments and links you to more detailed information about assessing specific components of your program, including information sources and strategies for data collection. It then helps you integrate information into an overall understanding of the market and your options for program design. The market in which your organization operates, including existing federal, state, and local policies that encourage or discourage residential energy efficiency and what other programs or market actors are providing energy efficiency services. This assessment identifies gaps in the market and opportunities for your program. You can find more information about this aspect of market assessment in the Market Position & Business Model Assess the Market handbook. Information about potential customers, the barriers they face, and what types of marketing and outreach will help encourage them to pursue upgrades. You can find more information about this aspect of market assessment in the Marketing and Outreach Assess the Market handbook. Your potential customers’ opportunities and needs for financing. You can find more information about this aspect of market assessment in the Financing Assess the Market handbook. Information about the availability and skills of local contractors to do upgrade work for your potential customers. You can find more information about this aspect of market assessment in the Contractor Engagement & Workforce Development handbook. Mechanisms to deliver products and services to your customers. 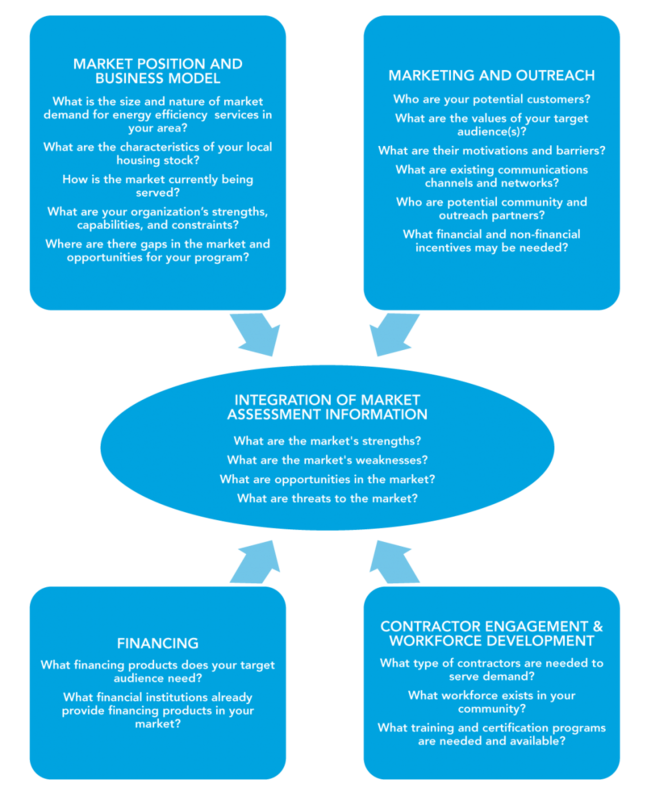 Assessing the market to inform your program design decisions involves steps to gather and integrate information about components of your program and market position. As you go through these steps to assess your market, make sure you take the opportunity to identify stakeholders and potential partners that can help you understand your market, potential customers, and program opportunities. When you design your program, your decisions about target audiences, services, and delivery channels should be informed by your organization’s position in the market and consistent with your organization’s business model. For example, if your organization is seeking to fill a gap in the market for moderate income, suburban homeowners, the types of services you offer and how you deliver them to these homeowners will be quite different than if you are focusing on urban, multi-family buildings. Your organization’s strengths, capabilities, and constraints in providing needed products and services in the market. From its experience, BetterBuildings for Michigan developed the Community Sweep Tool Kit, as well as a community readiness assessment tool within its Actioniirs Web app, which helped program organizers gather information from community members. An understanding of federal, state, and local policies is of particular relevance for program design because they may create or constrain opportunities for your program. Policies such as utility bill disclosure or energy assessment requirements may help create demand for residential energy efficiency products and services for particular segments of your market. Your program may also be impacted directly by policies or regulation—for example, if you are running a program as a regulated utility—which will influence or constrain the services you can offer and to whom. State & Local Energy Data, a tool developed by the U.S. Department of Energy, which presents energy market information by zip code as well as a cataloged, customizable list of actions to help local communities make strategic energy decisions. The EFC examined the year of home construction, total square feet of homes, types of heating systems, and fuel for heating and cooling. Based on this analysis, the EFC recommended areas of the city (by zip code) and types of homes (e.g., natural gas heated) on which programs should focus. The assessments also suggested what types of upgrade measures garner the highest energy and costs savings. Once you have identified opportunities for energy and cost savings in your community, you need to know who your customers are and what will motivate them to pursue home energy upgrades. For example, your assessment of the local building stock may indicate an opportunity to upgrade older homes in several neighborhoods where the houses are served by oil heat. What do these homeowners need and value? If you find that they most value increased comfort and reduced heating costs, your marketing strategy should show them how home energy upgrades can heat their homes at lower cost. You may also want to design your program around air sealing, insulation services, and heating system upgrades (e.g., transitioning from oil to electric heat pumps). Potential community and other outreach partners. Information about contractors that can do the work—or there may not be many contractors in the area that are qualified. For information on assessing contractors in your area, see the Assess the Market Handbook for Contractor Engagement & Workforce Development. To understand financing opportunities and needs, identify the financial products currently available in the marketplace and whether additional financing options could help meet or support demand for residential energy efficiency upgrades. For example, your market assessment may reveal that a segment of your target audience already has sufficient access to affordable financing (e.g., through home equity lines of credit) or the ability to pay out-of-pocket, while another segment needs financing but has trouble qualifying for it under traditional underwriting standards. Your program could, for example, consider working with your financial partners to establish an alternative set of underwriting standards that takes other data points into account and can help some homeowners qualify for loans. Identifying financial institutions that provide loan or other products for home energy upgrades and understanding their products and potential limitations. An assessment of your local contractor network and workforce development resources will identify the capacity of the current workforce and recruitment, training, or other needs to serve your market. An unqualified workforce may be a barrier that your program needs to overcome. For example, if you find that there are few contractors specializing in the types of services your community needs, your program should focus on training, certification, and possibly licensing. You may also need to put relatively more resources into quality assurance. Identifying organizations that can help trained home performance professionals find jobs. A thorough market assessment will generate a lot of information. Undertaking a SWOT analysis is a good way to integrate this information and start developing options for program design. "SWOT" stands for "strengths, weaknesses, opportunities, and threats." What are the strengths of the market, such as high customer awareness and interest in residential energy efficiency or an established contractor network? What are the weaknesses in the market, such as lack of financing or trained home performance professionals? What are the opportunities in the market, such as a set of customers that are interested in residential energy efficiency but are not able to access existing utility incentive programs or an opportunity to complement an existing program? What are the threats to the market, such as declining state or utility budgets for energy residential efficiency incentives? Identify what resources and skills your program may need and what services and business model are most appropriate for your market. These insights from your market assessment will be further refined as you begin making program design decisions to craft a program that fits the particular opportunities, needs, and barriers to home energy upgrades in your community. This U.S. Department of Energy Focus Series highlights the BetterBuildings for Michigan program’s community readiness assessment tool. This presentation describes California property owners' specific interest, awareness, and perceptions regarding energy use, energy efficiency, home energy upgrades, and related topics. This resource, provided by DOE, presents energy market information to help state and local governments plan and implement clean energy projects. The resource also includes a local energy toolbox that provides a cataloged, customizable list of actions to help local communities make strategic energy decisions. This summary from a Better Buildings Residential Network peer exchange call focused on changes and trends in the market for home energy upgrades.